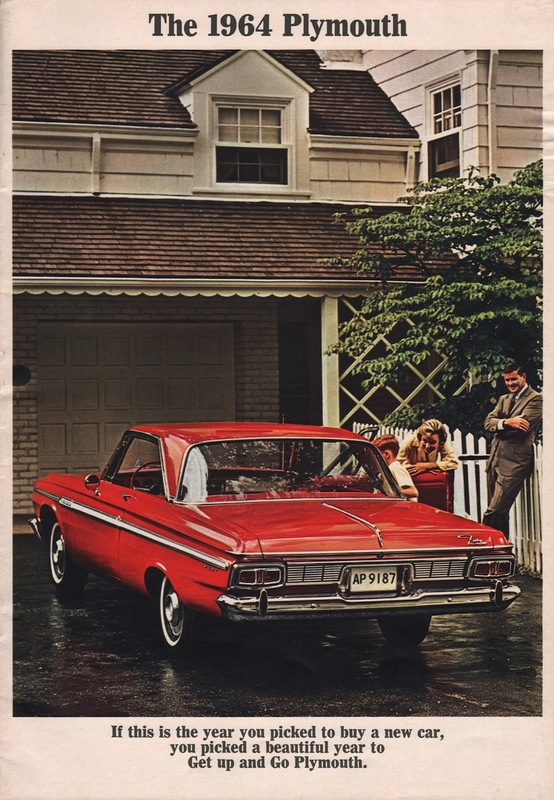 Sales brochure featuring the 26 models of Plymouth for the 1964: Sport Furys, Furys, Belvederes, and Savoys. Five engines are the 145hp 225ci 6-cylinder, 230hp 318ci 2-barrel V8, 265hp 361ci 2-barrel Commando V8, 330hp 383ci 4-barrel Commando V8, and 365hp 426ci 4-barrel Commando V8. Exterior color options include Ebony, Light Blue, Medium Blue, Dark Blue, Sandalwood, Medium Turquoise, Dark Turquoise, Medium Gray, Ruby, Chestnut, White, Light Tan, and Medium Tan.